This blog post is part of Blogathon 2009, in which I am blogging for 24 hours straight in order to raise money for the Vancouver Public Space Network, an entirely volunteer-run organization who do advocacy and education on the public realm in my home of Vancouver, British Columbia. Please consider supporting by sponsoring me with a pledge, leaving a comment or contacting me to contribute a guest post. Jason Vanderhill is a local art enthusiast/supporter and photographer. In addition, he also serves as the Communications Coordinator for the Vancouver Public Space Network, and makes a mean set of transit and civic pride 1″ buttons. Earlier today I crossed paths with Karen and I’ve taken the opportunity to provide a guest post for the cause! What cause you ask? The VPSN of course! 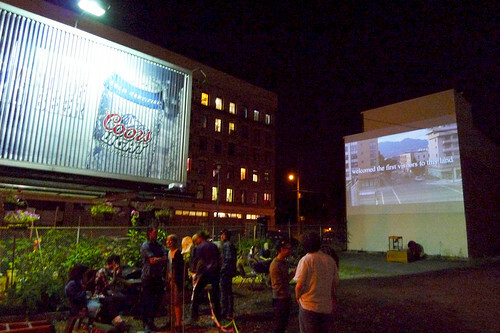 I wanted to take a moment to attempt to describe exactly what “Traces: Projecting Neighbourhood Stories” was all about, because it’s a great example of the type of public space event that the VPSN heartily endorses (even though the VPSN wasn’t officially involved in this project). How can I best describe this event? Briefly, I will attempt to provide you with a recipe for the event. Take a number of large, blank outdoor walls, a sidewalk, a side street, and an unused urban space. Add some story-telling, film, animation, music, and popcorn. Insert lots of volunteers. Combine with imagination, inspiration, and some good old fashioned socializing to create a fantastic event. 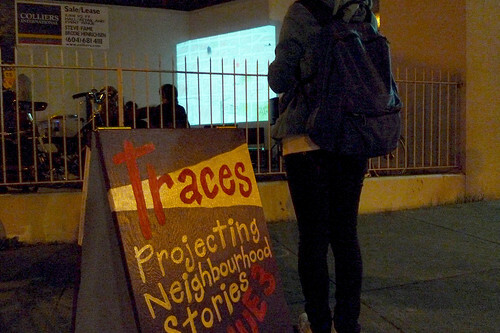 “Traces: Projecting Neighbourhood Stories” was presented on July 24-25 (so yesterday, Friday, as well as today, Saturday), 9:15-11:00pm at various venues along 400-block East Hastings between Jackson and Dunlevy. 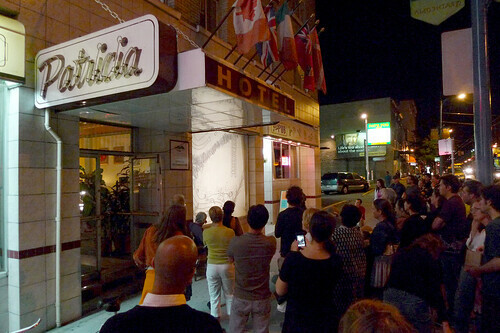 Without requiring admission, pedestrians could wander from venue to venue, absorbing the sights and sounds, taking in the stories, and chatting with friends and newly acquainted neighbours. After a hot summer’s day, it made for a truly artfully inspired evening. I caught the event on Friday night, and assuming it wasn’t rained out/canceled this evening, I imagine much of the success of the evening was repeated again Saturday night. This photoset that seeks to give you an overview; here are a few highlights. Should you want to know more about Traces: Projecting Neighbourhood Stories, an article about it also appeared in the Georgia Straight: Traces projects Strathcona’s hidden stories. 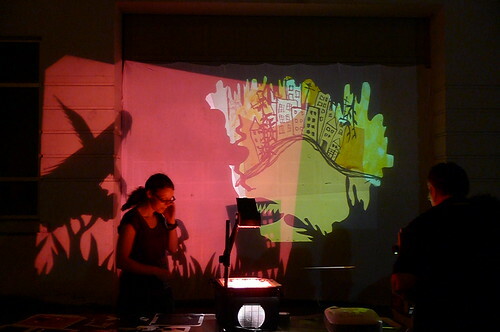 Traces: Projecting Neighbourhood Stories was produced by MediaUndefined. If you missed it, it will be presented again as part of the Powell Street Festival on August 1, 2009, 9:15-10:30pm in Woodland Park. All photos by JMV. Thanks Jason for the re-cap of this incredible community art event! This entry was written by Jason Vanderhill, posted on July 25, 2009 at 11:51 pm, filed under Blogathon 2009 - Vancouver Public Space Network and tagged projection, public art, public space, stories, storytelling, strathcona, traces projecting neighbourhood stories. Bookmark the permalink. Follow any comments here with the RSS feed for this post. Post a comment or leave a trackback: Trackback URL. Four hours to go! Almost there!